Widgets allow you to place common elements (such as links to other sites, index of content on your site, a log in area, or list of upcoming events from a Google Calendar) at a consistent location on every page of your site (called a Sidebar). The theme you use will dictate which areas of the screen (sidebars) can be used for widgets, and the theme may also provide unique widgets. Therefore, the available widgets and sidebars vary depending on the theme and plugins you’ve chosen for your website. Click the Appearance section of your dashboard. In the middle of your screen, you will see a list of the available widgets. On the right side of your screen, you will see all of the available content areas on your site where you could place those widgets. To place a widget in a content area, click the Primary Aside title to expand the content area if not already expanded. Drag the widget into the Primary Aside area. Some widgets will open up and provide some modification options. When you have selected all of your preferred options, click Save. 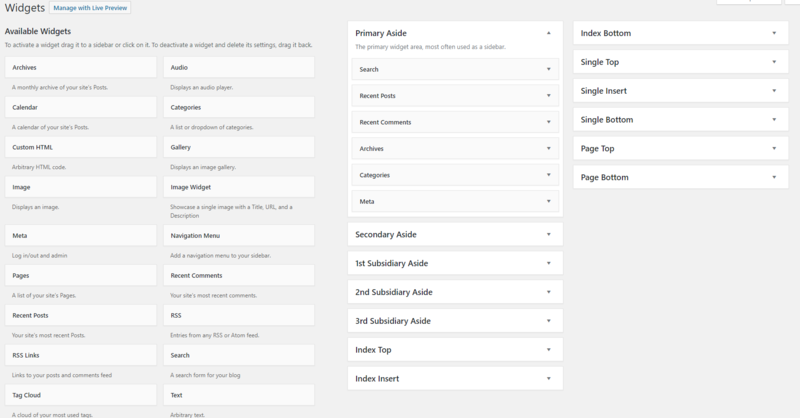 Finally, should you wish to display a page on your website that does not include your sidebar(s) of widgets, instructions are available on the Knowledge Base. Please note that the widgets are tied to your theme. When you switch themes, you will lose all of your widget settings and need to start afresh.